Q. Is there really Jack Daniel’s® Whiskey in the mustards? A. The Old No. 7® Mustard does contain the whiskey, but the other flavors include whiskey flavoring. Q. 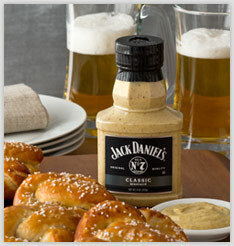 Are Jack Daniel's® Mustards gluten-free? A. Yes, Jack Daniel's® Mustards are gluten-free. Q. Where can I find the best by date on Jack Daniel's® Mustards? How do you read the date? A. The Best By date code should be located on the back of the container near the lid. The date code will look like the following: "Best by mm-dd-yy Plant ID, Military Time". So for example, Best by 03-08-13 DW 12:14, would be a best by date of March 8, 2013, plant ID would be “DW” and time would be 12:14 am. Note the plant ID could be left blank. Q. Where can I buy Jack Daniel's® Mustards? A. Please use our Where To Buy tool to find Jack Daniel's® Mustards in a grocery store near you. Q. Are there coupons available for Jack Daniel's® Mustards? A. Please check your local retail grocery stores for in-store savings on Jack Daniel's® Mustards. We do not provide online coupons for this brand at this time.